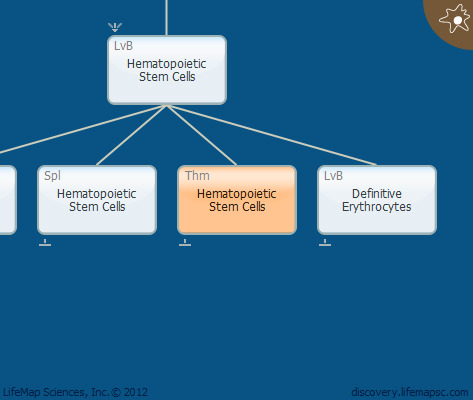 Hematopoietic stem cells (HSCs) are multipotent, myelolymphoid stem cells, which serve as a source of hematopoietic cells. After expansion in the fetal liver, HSCs colonize the bone marrow, spleen and thymus.The same cytokine affecting the development of the HSCs in the bone marrow seem to be active in the fetal thymus. Currently the T cell lineage commitment is thought to occur before the cells reach the thymus. In adulthood, the thymus and spleen are colonized by bone marrow progenitors. Hematopoietic stem cells migrate from the fetal liver to the thymus on E11. These precursor cells are lineage-negative (Lin-), namely, they lack detectable surface markers specific to the T, B, macrophage, granulocytic, and erythroid lineages.